As with any conference, the time coming back to work is filled with everything that wasn’t attended to while you were gone. 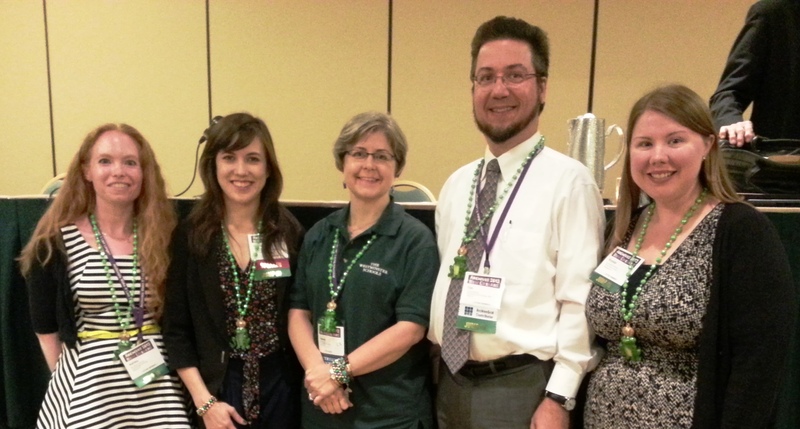 Consequently, this post is a bit late in coming, but I did want to recap some of the sessions I attended at the 77th Annual Meeting of the Society of American Archivists in New Orleans, Louisiana. This was the day I sat for the very first Digital Archives Specialist Certification comprehensive exam. Nerve-wracking, yes, and I still don’t have the results, but overall I felt it was a good test and covered a wide variety of topics. The rest of the day I was able to spend as a guest in the Academy of Certified Archivists‘ Board meeting as the incoming Regent of Certification Maintenance. It was nice to meet the Board members I had only corresponded with via email or talked with on the telephone. Most of the sessions I attended had something to do with digitization or born-digital records. However, I did attend sessions on other topics. Below are some of the sessions I attended, and if available, a link to their presentations. Hurricane Katrina: Disaster Recovery and Documentation in Archival Collections: (Twitter hashtags #saa13 #s102) Hurricane Katrina serves as a prism for examining a variety of archival issues. Subjects discussed include disaster recovery inside an affected repository; development of a large-scale digital collection preserving firsthand accounts, images, blogs, and podcasts; and management of constituent case files in congressional papers. Exploring the User Experience with Digital Primary Sources: (Twitter hashtags #saa13 #s205) As archives increasingly use the web to provide access to holdings, it is critical to identify and continually update our knowledge of user needs and behaviors. This session focuses on user needs and how usability assessment can help us evaluate the extent to which our online interfaces and tools are meeting the needs of target audiences. Panelists discuss recent studies with various methodologies and share findings related to the user experience with online primary sources. Streamlining Processing of Audiovisual Collections for Preservation and Access: (Twitter hashtags #saa13 #s309) Archivists who manage audiovisual collections process materials at the item level for practical reasons: items arrive insufficiently labeled, unidentified, or inaccessible for playback. As a result, the descriptive emphasis is on the physical object itself and on format and condition characteristics that address preservation concerns, often without contextualizing the object as part of a collection for access by researchers. Panelists address streamlining processing to balance the needs of both preservation and access. Incentivizing Volunteer Workforces for Crowd-sourced Projects: (Twitter hashtags #saa13 #s404) Crowd-sourcing has been implemented creatively by many different organizations using a variety of tools to carry out projects that previously had been impossible. Because these projects are community-driven, it is important to look at ways in which to recruit volunteer workforces and to maintain those workforces across projects sponsored by the same institution. As institutions move forward with further community-driven projects, it is important to evaluate approaches that have been successful as well as those that are currently being employed to look to future possibilities. Digital Data Preservation for Small and Mid-Size Institutions: (Twitter hashtags #saa13 #s503) Digital POWRR, or Preserving (digital) Objects with Restricted Resources, is a project seeking an all-encompassing methodology for digital preservation that provides users the access to, or restrictions of, digital content that they create. Two project members — one from a mid-size public research institution and one from a small, private liberal arts school — present the group’s findings, which audience members from all institution types will find valuable. Defining Levels of Preservation and Management for Electronic Records: (Twitter hashtags #saa13 #s604) Four projects address first steps or levels of preservation for electronic records: OCLC Research’s “You’ve Got to Walk Before You Can Run: First Steps for Managing Born-Digital Content Received on Physical Media,” CoSA’s use of the Digital Preservation Maturity Model, and the National Digital Stewardship Alliance’s “Levels of Digital Preservation” and “Minimal Processing for Electronic Records.” Discussing these projects together helps archivists reach consensus on a minimal standard for processing and preserving electronic records. Opportunities for Archives and Archivists in the Changing Landscape of K-12 Public Education: (Twitter hashtags #saa13 #s702) Changing standards in K-12 public education can leave archivists wondering how they can support teachers. Session participants learn about the Common Core State Standards and ways in which archivists can support teachers in meeting state requirements. K-12 instructors who teach using Common Core State Standards in History/Social Studies and English/Language Arts discuss how they use archival materials in their classrooms and how archivists can provide support in meeting their curricular needs. In the “Lone Arrangers” Roundtable meeting, Katherine Roe of the New York State Archives gave a great presentation on archives and advocacy. One “lone archivist” got up and shared that she often tells people who asks what she does: “I preserve the history and tell the stories.” This got a great round of applause. There were so many sessions that I wanted to attend but have not yet figured out how to be in two places at once. Take a look at the whole schedule available online. If there is a session or paper within a session that looks interesting to you, many speakers will be happy to share their paper or presentation with you.